A new breath analyzer called the Single Breath Disease Diagnostics Breathalyzer has the capacity to check for a variety of biomarkers, or biological indicators, of disease. The breathalyzer, invented by Dr. Perena Gouma of Stony Brook University, uses a sensitive ceramic chip to detect molecules in exhaled air that are only present in the case of particular disease processes. For instance, the concentration of ammonia in the breath gives information on how much waste is in the blood, which would allow home hemodialysis patients–hemodialysis is a technique used to clean waste out of the blood in the event of insufficient kidney function–to monitor their treatments. Similarly, the chemical acetone, found in nail polish remover, is a biomarker for uncontrolled diabetes. There can be different types of nanowires, each with a tailored arrangement of metal and oxygen atoms along their configuration, so as to capture a particular compound. For example, some nanowires might be able to capture ammonia molecules, while others capture just acetone and others just the nitric oxide. Each of these biomarkers signal a specific disease or metabolic malfunction so a distinct diagnostic breathalyzer can be designed. 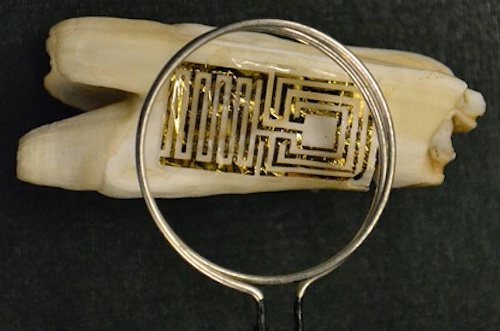 Gouma envisions a future in which the device could test for infection as well, noting that the wires could be programmed to detect viruses or bacteria. While the breathalyzer isn’t yet available to the public–testing is still underway–Gouma hopes to see the device hitting the consumer market within a few years.